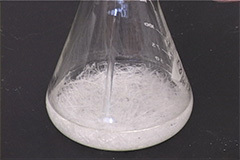 Recrystallization is a purification technique; it allows us to remove impurities in a sample. The idea is you place impure solid in a liquid such as water or ethanol. After heating for little while, the solid will dissolve in the liquid (also known as the solvent). 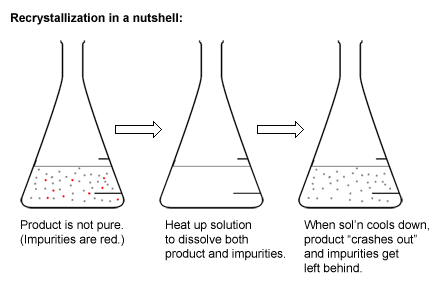 When the solvent cools back down again, the solid will precipitate out of the solution and leave the impurities behind, still dissolved in the solvent. This should leave you with a purified solid. Let’s take a look in more details how (and why) this works. The solubilities of most solids in solution increase as the temperature of the solution increases. For example, the solubility of acetanilide in ethanol at 0 ºC is about 18g/100mL. This means that if you drop 50 grams of acetanilide in 100 mL of ethanol at 0 ºC, about 18 grams will dissolve in the ethanol and the rest (~32g) will remain suspended in the solution. But the solubility of acetanilide in ethanol increases to about 80g/100mL at 50 ºC. This means that if we heated up the same acetanilide-ethanol suspension to 50 ºC, all of the acetanilide would dissolve. In fact, we can add about another 30 grams of acetanilide to this solution and it would still dissolve- but once we added more than 80g, additional solid acetanilide would no longer dissolve, and we would have a suspension once more. At this point the solution is said to be saturated. So let’s say we had 50g of acetanilide dissolved in 100mL of ethanol at 50 ºC. What would happen if we allowed the temperature to cool back down again to 0 ºC? At this point, we have more acetanilide dissolved in the ethanol that it should be able to hold- 50g vs. 18g, so the solution is said to be supersaturated. That means that sooner or later, the extra ~32 grams of acetanilide should precipitate out of solution (also known as crashing out). We then collect the acetanilide via vacuum (or gravity) filtration. The liquid that remains after the filtration is known as the supernatant mother liquor (or just mother liquor for short). It’s usually a good idea to save it. Because there were relatively little impurities compared with the relatively large amounts of acetanilide and ethanol used, those impurities should remain dissolved in the solution; the ~32 grams of acetanilide we collect should be pure. Polar compounds are soluble in polar solvents such as water, methanol, and ethanol. If your compound contains a polar group (see image below), it’s best to use these solvents. Non polar compounds are soluble in non-polar solvents such as hexanes and diethyl ether. The speed at which you allow a saturated solution to cool affects the size of the crystals that form! If you take a hot solution and slam it into an ice bath, you’ll get smaller crystals. If you allow a hot solution to cool without any added heat for 10-20 minutes, and then place it in an ice bath, you’ll get larger crystals. This makes an important different- if you have smaller crystals, they are more likely to clog a filter! Everyone likes to get out of orgo lab as soon as possible, but a clogged filter could add a good 30-40 minutes to your procedure. It’s worth it not to place your solution in an ice bath right away; let it cool close to room temperature first. Let’s say you accidentally spilled group black pepper in a solution of acetanilide and ethanol. The black pepper won’t dissolve. So how do you remove it? By filtering the liquid- the black pepper will get stuck in the filter paper, and you can continue to recrystallize the liquid solution as normal. This happens sometimes. You probably used too much solvent, or you’re just unlucky. The best way to get product to crash out is to add a seed crystal. This is just a small amount of pure material. Your TA usually has some handy (or see another lab group that finished the experiment before you). You can also try scratching the sides of the container with a stirring rod. This works because you pick up a small amount of solvent which evaporates and leaves behind a small amount of pure product. In other words, it’s just another way of adding a seed crystal. Remember that there will still be some of your product dissolved in your mother liquor after the first recrystallization. So if you wanted to, you can allow some of the mother liquor to evaporate and collect more product. Always save the mother liquor until your TA tells you it’s OK to throw it out. In this lab you’re going to acetylate aniline. Acetylation is the addition of an acetyl group to an alcohol or amine. (This mechanism won’t be covered until the spring semester. But you can see it here if you’re interested). In the textbook it says to use a test tube. But it might be more convenient to use a 25 mL Erlenmeyer flask, which has flat bottom, so it’s easier to handle (you can place it on a flat surface). Both aniline and acetic anhydride are liquids. You’re going to pre-weight an empty test tube, add ~4 drops of aniline, and then weigh the test tube again to determine exactly how much aniline you added. You’ll need this number later to calculate a percent yield. After you added and weighed the aniline, add 6-7 drops of acetic anhydride. As always, do this stuff in the fume hood. Acetic anhydride becomes acetic acid when water is added. It will smell like vinegar because that’s what it is- aceto is Latin for vinegar. Shake it like a Polaroid for about five minutes. That should be it- the reaction is done. Now it’s time to purify your product... via recrystallization. Add ~5 drops of water to the tube and heat until the solid dissolves. Then let it cool on its own for 5 minutes before you put it an ice bath. Crystals should form. Collect the product using vacuum filtration through a Hirsch funnel. Scoop your solid onto a pre-weighed drying dish. You’ll leave it in your drawer to dry until next week, when you weigh it again and calculate a percent yield. Q: What happens if you add too much solvent during recrystallization? A: The goal is to add just enough hot solvent to dissolve your product, and not any more. Otherwise, more of your product will stay dissolved in the solvent when you cool it back down, and you will collect less product. This lowers your percent yield (also known as a percent recovery). Q:During filtration, why is it important to only wash your solid with ice-cold solvent? A: Remember that your product is soluble in your recrystallization solvent. If you washed with hot solvent, it would dissolve some (or all) of your product and you would have a lower percent yield. Q: Why should you fold and put creases in your filter paper prior to filtration? A: The folds increase the surface area of your paper, allowing for a faster filtration. Q: What factors influence the solubility of a solid in solution? Notice that the para isomer has the highest melting point and the lowest solubility, even though the polarities of all three isomers are similar.